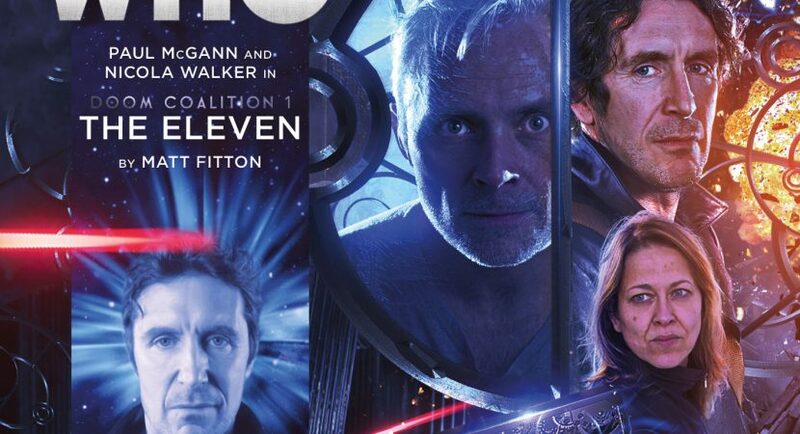 Doom Coalition is a good starting point for those of us playing catchup on years of Eighth Doctor Adventures (I’ll get there sooner or later, but I’m tired of having to skip Paul’s latest releases because I’m trying to avoid spoilers). In The Eleven, we meet the Doctor’s recurring antagonist for Doom Coalition (the beginning of it, at least), a renegade Time Lord perfectly tailored for the audio medium, a madman with multiple personalities all arguing with one another. Is Mark Bonner really voicing all eleven of them? Impressive. It’s a great concept: a Time Lord whose past regenerations are all jumbled up in the same head, with one (slightly?) good incarnation — Eight — and the other personalities all nasty in one way or another. Liv: Coast clear. Let’s do it! It’s strange revisiting Gallifrey without the characters I’ve come to know in the first three seasons of Gallifrey (another spinoff in which I’m years behind.) Without that conniving complexity, it feels a little flat. There’s references to a president conveniently off world on diplomatic business (not Romana), a new CIA Coordinator (Lady Ferina, suitably paranoid but a bit dim compared to Narvin), another benevolent Cardinal and old friend of the Doctor (Padrac), and a brash, bright student from the Academy, Kiani, who sounds a little like Charlie. All of them serve as props and pawns (and perhaps accomplices?) for the Eleven, so it’s understandable why they’re not more fleshed out as characters. Once the Eleven breaks free, chaos descends on the Capitol in short order. It’s reminiscent of some of the mayhem in Gallifrey, but abbreviated, since this is a one-hour prologue to a series that won’t be confined to Gallifrey. The pacing is quick, keeping both listeners and the Doctor on their toes, mixing moments of mortal danger with our heroes being clever and brave and three steps behind the foe. For old fans, there’s unobtrusive callbacks to The Deadly Assassin and The Five Doctors. This first story arrives at a partial resolution (albeit a grim one). But of course, Doom Coalition comes in series of four, so this is only part one. I look forward to the next. However, burning my listening queue at both ends, I first need to catch up on more 2017 releases. Once again, my habit of avoiding spoilers (even the summary on the BF website) allowed me to enjoy more fully a cameo at the beginning, in this case Syl’s. He’s very convincing in his one scene. I also appreciate how this story stets up the Eleven to be the Doctor’s opposite, both in the way he steals a TARDIS (but by murdering rather than taking a companion) and in the sense that his Eighth incarnation, the nicer one, is the exception to all the rest. In fact, he =sounds a little like Eight.